Today's topic for the Friday Five 2.0 is Ways to Keep Warm. Living in Las Vegas, our winters are pretty mild. No bomb cyclones. No blizzards. We did get a little rain earlier this week, but nothing to get too worked up about. We do get overnight lows down in the 30s and 40s though. Perfect weather for cozying up with a hot cup of cocoa - definitely one of my favorite ways to keep warm. I'm kind of lazy about making hot cocoa, though. I tend to stock up with a big canister of Swiss Miss to get me through the winter. I may be lazy about making the cocoa, but sometimes I like to go a little crazy with additions to make it even more delicious. If you just want to add a little different flavor, try adding a pump or two of flavored syrup. Torani has a big variety. I'm currently in love with Salted Caramel. 😋 Or Raspberry would be delicious, too. I do love the raspberry/chocolate combo. Why not add a some flavor and health benefits?! Cinnamon is pretty amazing. There are a lot of reasons for adding cinnamon to your diet! To name a few, it tastes great, is filled with antioxidants, and helps freshen breath. Add 1/2 tsp to the powdered cocoa mix and then add hot water. Matcha powder seems all the rage right now. Like Cinnamon, it is also filled with antioxidants, including EGCg, which is known for its anti-cancer properties. Matcha also promotes relaxation and calm which pairs nicely with the peppermint and its ability to help relieve headaches. Sipping on some Match+Peppermint cocoa is very relaxing and calming. Perfect for a cold winter night! Stir in 1/2 tsp of Matcha powder and less than 1/4 tsp peppermint extract for the perfect end to your day. Love that PB and Choc combo? Mixing some powdered peanut butter in with your cocoa mix will satiate that craving! Plus, like cinnamon and matcha+peppermint, there are some health benefits to peanut butter. Peanut butter is a good source of Vitamin E, Magnesium, Potassium, B6, and Protein. Using powdered PB gives you all those vitamins and minerals with much less calories, fat, and carbs. Can't complain about that! Mix 1 Tbsp into your cocoa for a yummy treat. Maybe you're not concerned with any added health benefits, but just want to relax after a hard day at work. 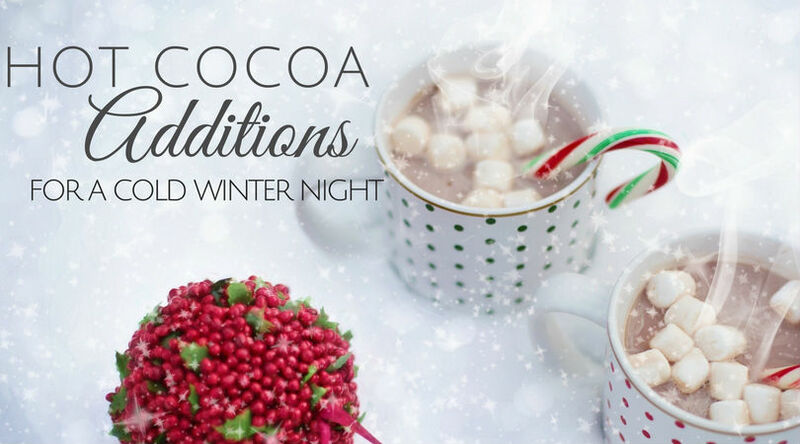 Try adding a shot of Bailey's or Whipped Cream Vodka to your cocoa. You'll be relaxed in no time! Bonus Tip: When mixing cocoa from a powder, add just a little liquid. Mix it with the powder until wet. Then, add the rest of the water and stir well. Which of these additions would you want to try? 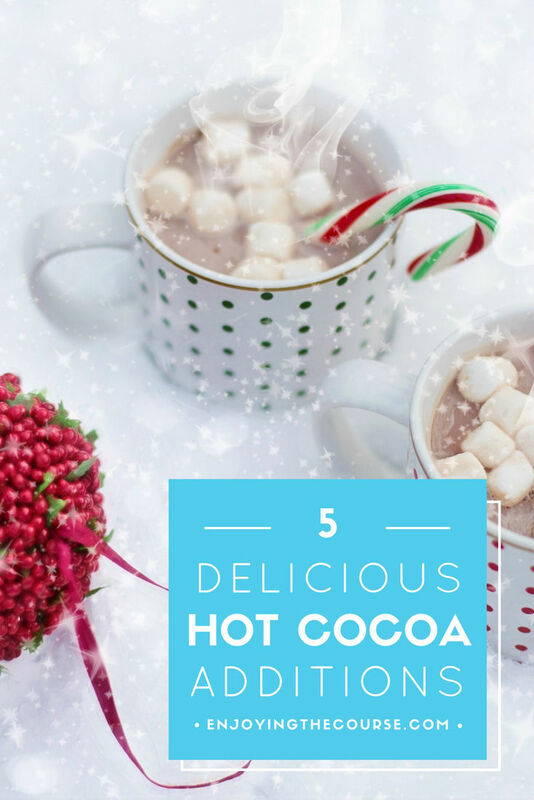 Do you mix anything unusual into your hot cocoa? I'm linking up today with Running on Happy & Fairytales and Fitness for the Friday Five 2.0. I'm also linking up with Farrah, Esther, and Annmarie for Foodie Friday. Thanks, Julie! Can't go wrong with an adult cocoa. :) There are so many options to make it perfect! I've never thought of matcha and peppermint before! Cool! I was a little skeptical, but I really enjoyed it! I sometimes get Mexican hot chocolate, and they have a little bit of chili powder in there. It really complements the chocolate and cinnamon. That sounds super good, too! I'll have to experiment with adding chili powder. Thanks for the suggestion! I like the adult version. I don't drink it much because it has caffeine and I have enough trouble getting to sleep. Chocolate/Raspberry is a such a great combination! I have never thought of adding powder PB to hot chocolate, that would sure give it a different flavor. If you like chocolate and peanut butter, I bet you'd love stirring some into your next cup of cocoa!